Hello, Fluffsters! Happy last day of September! That may be true, but when has that ever stopped me? …Which you probably gathered from the title. But oh well. 1) September starts with an “S.” This might not seem like an interesting fact, until you realize that it’s the only month that starts with an “s”. In fact, it’s one of only two months to have an S in it. 2) It originally comes from “sept” which is a form of the word for serpent. Uh, are you sure you don’t actually mean “septem” or “seven”, for the seventh month? Yes, I’m sure I don’t mean seven. It’s not the seventh month, after all! That would just be silly to name it after the number 7, when it’s the ninth month. 3) There are a number of traditional holidays in September. These include “Welcome Pumpkin Spice” day, held on the day when day and night are equal time. This is held in honor of the traditional vegetable flavor, in partial penance for all the junk eating we will do in the later months. By celebrating a vegetable this month, we pretend to be healthy and soothe our consciences. So, I have not heard of that holiday. Given that I’m very good friends with Google, are you sure you know correctly about that one? Positive. I’ve seen it celebrated. There’s even a movie coming out about it! 4) All food that is orange gets you double bonus points in September, after the Pumpkin Spice celebration. Fact. Every goldfish cracker is worth twice as many points as it usually is. Same with carrots, pumpkins, fall leaves, and carrot cake frosting. Now I know you’re making stuff up. Points for foods you eat? What is this? And eating fall leaves? Webmaster, can you please explain what you’re talking about? …Oh, look at the time. Well, Happy Last Day of September, folks! I hope you enjoy your orange foods and pumpkin spice, and avoid being bitten by one of the snakes this month was named after. Bye! This entry was posted in Holidays, list, pointless, seasons, Webmaster and tagged holidays, list, pointless, season, webmaster on September 30, 2013 by Webmaster. Hello, Fluffsters! Happy Sunday! I hope you have a fantastic week coming up. I think I’ve mentioned “Simon’s Cat” before. If not, it’s a series of absolutely amazing animated cat videos. Whoever this artist is has captured essence of “cat” so well. You need to check out his other videos. But I just discovered last night that there was a very amusing one that I hadn’t seen yet! I know, isn’t it? But anyways, here it is. I found it very amusing. (The cat tries to help his human pack.) It’s completely worth watching. Enjoy! This entry was posted in ANIMALS!, Webmaster, YouTube and tagged animals, cats, webmaster, youtube on September 29, 2013 by Webmaster. What if Lightsabers were real? Greetings, Fluffsters! I wish you all a joyous Saturday. The online phenomenon you call “news” has been informing me that something called a “lightsaber” might now be a possibility. The article was moderately interesting, and seemed like it might be useful. You should consider reading it. WHAT? Lightsabers might become a reality? Oh that is so cool! This invention does bring up some interesting questions, though, if they are as fully capable as the lightsabers of the Star Wars franchise. What would happen if lightsabers were real? 1) Craft saw companies would go out of business. A sword that can cleanly cut through metal can definitely cut through a piece of wood no problem. It would also have a much nicer finished edge than the metal cut. 2) Food could be more sanitarily made. I’m looking at you, people who use their knives to cut and eat food. 3) More limbs would be missing. Habits die hard, and I’m guessing a few folks would try to eat off the blade of the “knife” they use, never mind that the blade itself can cleanly remove your tongue. And face. 4) Pocket Lightsabers, anyone? You have to admit, that would be pretty cool. Useful, too. It would be similar to a pocket knife, but more easily transportable. 5) TSA would increase even more. Soon they’d need to do some sort of search to ensure that you aren’t taking a mini lightsaber on board the plane. There are also some questions this raises, though. In the Star Wars universe, the guns are primarily light based. We also have proof that the lightsabers are able to block and reflect the substance of light. What would a lightsaber do to a metal bullet, though? Does it instantly melt, and therefore provide extra casing for the lightsaber? Does the metal vaporize? Would anyone using an extra wide lightsaber be protected from machine gun bullets? All of these things might be worth considering. I hope you have a good weekend, Fluffsters! This entry was posted in fluffy, list, real world and tagged Fluffy, list, real world on September 28, 2013 by Webmaster. Want to buy a fox? Today’s post is very short, because it can be. I just discovered that you can buy a domesticated pet fox. For about $9,000, but they’re still for sale. Does anyone want to buy me one? Because this post seems to short without something else, here’s a very impressive video. There’s already a marching band version of “what does the fox say.” The video went up on September 14. This entry was posted in Uncategorized on September 27, 2013 by Webmaster. Sometimes, I really don’t know what on earth the cooks where I am are thinking. Seriously. 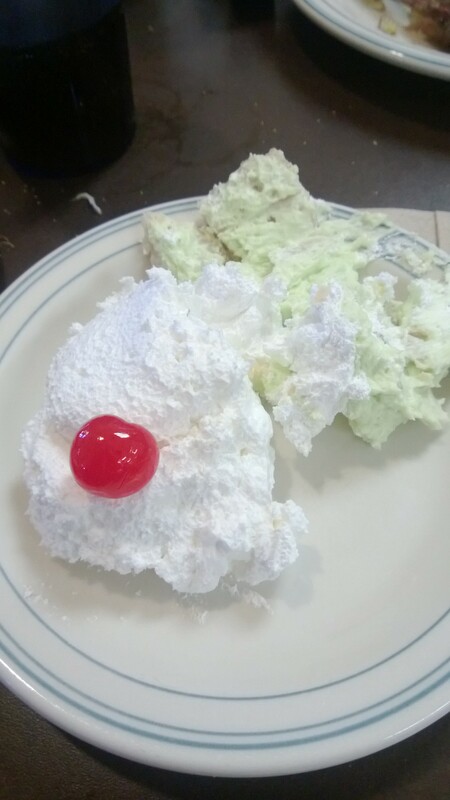 I think the white stuff is the “lemon dessert.” I still have no idea what it was. But I figured it was fluff, and so I needed to take a picture of it, and try it. All for you, Fluffsters, and for the good of this site! Your dedication to this site is heartwarming. And maybe gag inducing. The good news was that they actually tasted ok. The Key “lime” pie could have used much more lime flavoring, but it wasn’t bad. I’d give it probably about a 3/5 for flavor. If you need to pay for it, it’s totally not worth it. If you get it with your meal, however, you can go for it if you really want dessert. It’s not phenomenal, but the flavor was ok. The cherry was a typical maraschino cherry, fortunately. So it tasted moderately fruitlike, really sweet, and fairly synthetic. I love maraschino cherries! The key lime pie was a little thicker than I was used to, but it was ok. Combined with the flavor, though, and it’s only worth getting if you’re really in a mood for dessert. Or writing a fluff blog, like I am. It would certainly not be worth spending extra money on. The “lemon dessert”, however? Well, I don’t think words can do it justice. 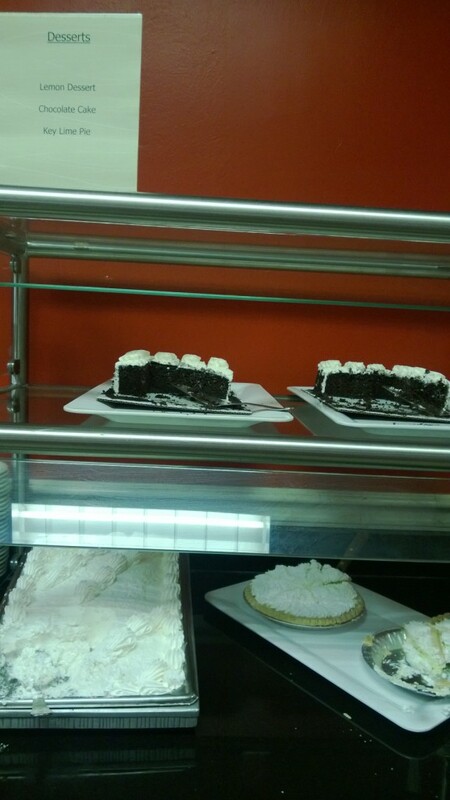 I would probably give that dessert about a 1.2/5. It didn’t taste bad, it just was very… weird. And had a bizarre consistency. I’m not sure I even noticed the flavor, the texture was so different. I would not recommend getting it, even if it’s included, unless you’re a) masochistic, b) writing a blog about food / fluff, d) always curious to try new culinary… “experiences”, or c) both. I sort of expected it to have a whipped cream or cool whip sort of consistency. It didn’t. It was practically impossible to describe. So here’s a video of my actually using a bit of pressure on the spongy, almost gelatinous whipped substance. Enjoy? This entry was posted in Uncategorized on September 26, 2013 by Webmaster. Some ways to tell that you need coffee. 1) It’s the morning. If it’s the morning, you need coffee. No questions asked. …Wait. Even if it’s 4:00am? When you’re supposed to be asleep? 1 b) It’s morning and you’re supposed to be awake. There. Better? 2) You’ve got a long day ahead of you. Coffee is always a good option when you’re facing a long day. Even if it’s the middle of the afternoon. 3) You’re dealing with allergies. I don’t know how, but coffee (especially caffeinated coffee) actually helps relieve allergy symptoms. Crazy, huh? AND coffee has anti-oxidants! 4) You accidentally pour the creamer into the trash can and start to put the mini carton into your cup. That’s definitely a sign that you need the coffee. 5) You don’t have the mental capacity to decide between coffee and tea. If you’re having that sort of problem, you definitely need coffee. There you go, Fluffsters! Five ways to tell that you need coffee. Happy Wednesday! This entry was posted in list, real world, Webmaster and tagged coffee, list, lists, real world, webmaster on September 25, 2013 by Webmaster. I know that this post is a bit late in coming, but better late than never, right? 3) Units of time. No unit of time stays the same. Seconds are “grains ‘o sand”, minutes turn into “Shots ‘o rum ago.” Hours are “turns ‘o yer hourglass”, Yesterday = “before last sunset”. After that, they piratify the months. (Septembarr, Arrrgust, Jul-aye…) It’s cute. 4) Personal info and media. Your timeline is your captain’s log. Your profile picture? That’s your “Jolly Roger.” You can update your portraits, videos (on the home page) are “bewitched portraits”, and your friends are “me hearties.” Statuses also are “update your plunderin'”. 5) Events. Events are “Grog Fests.” This would probably be very inappropriate if you are doing something like inviting someone to a memorial service. Except for that, though, it’s quite amusing. 6) Communications. Messages are “Bottle[s] o’ messages.” Any status that you update from your phone, also, is from your “pocket parrot.” Great, isn’t it? Well, happy Tuesday! I hope you have a wonderful day. This entry was posted in Webmaster and tagged internet, webmaster on September 24, 2013 by Webmaster. Ok, before I start commenting on my issues, I do want to give a full disclaimer: It’s a while since I’ve seen Tangled. I just did some artsy stuff dealing with Rapunzel, which reminded me of some of my issues with the movie, and so inspired this fluff post. Yeah. So, here ‘goes. I enjoyed the movie. It had its good points. It also has its less phenomenal points, and I really don’t think it deserved the glowing praise all my friends gave it when it first came out in theaters. But it was a fun movie. As usual with Disney movies, the “Furry Critter” stole the show. (The best characters were definitely the Animal Companions. Especially the horse.) The horse added great personality to the show, especially with his combination of horselike and unhorselike behaviors. I mean, really. You have a character that goes around hitting things/people with frying pans, and is addicted to apples. He’s extremely expressive, too, which just makes things better. Rapunzel herself is a nice enough sort. Disney played off her innocence fairly well, especially towards the beginning. They also did a great job of showing her conflicting emotions about finally doing what she wants, and yet also knowing that she’s breaking every rule her “mother” gave her. Mother Gothel is probably one of the weaker characters. Yes, she’s a selfish old meanie who takes advantage of an innocent for her own personal gain. But compared to other Disney villains? She’s actually quite tame. Especially towards the beginning. Ok, so she abducts the princess of the realm. She doesn’t have any sort of political motivation behind it, though. She just wants to live forever. I guess this puts her almost on the level of the Evil Stepmother from Cinderella. Even that Stepmother, though, was extremely unkind to Cinderella, in part for the purpose of political motivation. So, just to clarify… You’re defending a villain as being “not that bad” because she just abducted the princess of the realm and held her against her will? Hmm. So it would appear. I may need to get back to you on that. 1) I really liked the “I have a dream” song. That was fantastic. And all of them achieving their dreams afterwords. I especially liked the Mime. 2) It was also a very cute story all in all. 3) Frying pans. Who knew, right? That was a clever touch. 4) The animal companions. As mentioned before, they stole the show. 5) It was clever how they showed Mother Gothel only loved the hair. If you look back at the movie, you’ll see that whenever Mother Gothel is “affectionate” (Rather, saying “I love you”) toward Rapunzel, she’s actually being affectionate towards Rapunzel’s hair. Go back. Rewatch if you must. It’s there, and it’s cool. 2) How is she not more muscular? Let’s face it. Hair ways a lot. Her poor neck! 3) Why does her hair lose its magic when cut? And how does it not when she brushes her hair? Judging from my own hair, and how much of it comes out whenever I brush/wash my hair, it’s a wonder Rapunzel made it to her 6th birthday with magical hair left, much left her 18th. Also, why can’t her hair’s magic restore her strand of formerly magic hair to its full glory? But enough about hair. Mostly. 4) Why did Mother Gothel tell her when her birthday was? I mean, seriously. That’s sort of ridiculous. Especially since Gothel doesn’t even remember that it happens every year. And how did Rapunzel even learn about birthdays? She’s never seen anyone except Mother Gothel. How would she know about birthdays? 5) Social conventions in general. How on earth does Rapunzel know? I’m guessing it’s the innate Disney Princess-ness coming through. But even so, it’s silly. She shouldn’t be nearly as capable out in the real world, or have any sort of understanding about life in the real world as she does. Even Jasmine from Aladdin has a harder time adjusting to life outside her palace than Rapunzel did to adjusting to real life. It should definitely be the other way around. So, all said and done, I did enjoy Tangled. I thought it was well done, and it was nice having Disney characters singing again. There are definitely some unanswered questions that are problematic though. At least from my perspective. What about you Fluffsters? What are your thoughts on Tangled? This entry was posted in Movie Reviews, Webmaster and tagged movie reviews, webmaster on September 23, 2013 by Webmaster. -You mean your laziness where this blog is concerned? 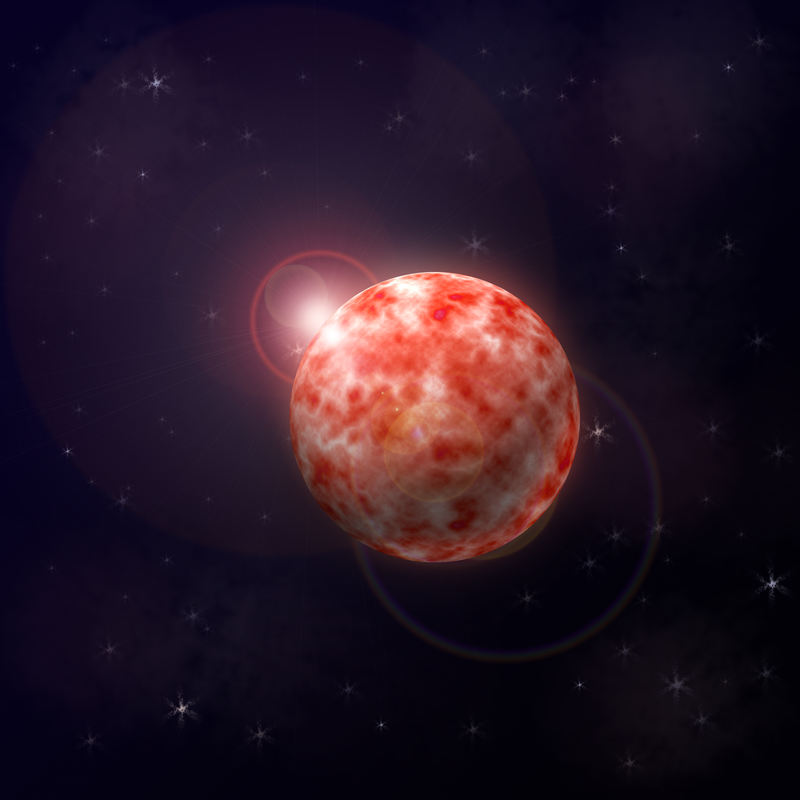 But, in keeping with the relative theme I’ve got going on, here’s a picture of a fake planet that I made. I made it by following this tutorial for photoshop. I hope you have a relaxing Sunday, and start the week off nice and refreshed! This entry was posted in crafts and projects, Webmaster and tagged crafts and projects, webmaster on September 22, 2013 by Webmaster. 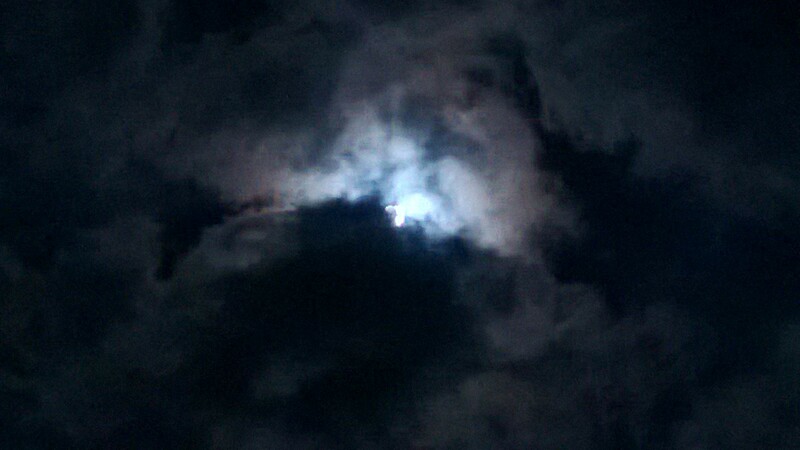 As a follow through on yesterday’s post, I have some moon and cloud pictures to share with you. Moonlight through the clouds. Isn’t it pretty? This of course doesn’t do the view justice, but it’s still pretty. I hope your weekend continues to be relaxing! This entry was posted in Uncategorized on September 21, 2013 by Webmaster.